Legacy. If you were anywhere within earshot of Lancaster Park, Christchurch sometime between 2.30 and 4.30pm on September 14, 1985 (or one of the more than 52,000 actually crammed into the ground- and crammed is no exaggeration at all), you will understand exactly the significance of the first word of this piece. It was billed as ‘The Match of the Century’, and, as almost never happens when something is hyped up to the skies, the entire game actually lived up to, and very probably exceeded all the build up and expectation. It was of course Canterbury versus Auckland. One reason for that match being so huge was because the mainlanders were attempting to break the record for Ranfurly Shield defences from…Auckland. The midweek 1960 clash at a full Eden Park, with Waka Nathan scoring beside the posts in the final seconds for Auckland to hang on to the Ranfurly Shield was also legendary. Especially with the Auckland team being stuck in traffic and the kick-off being delayed. Not to mention their coach Fred ‘The Needle’ Allen missing Nathan’s score because he was puffing away on a cigarette in an absolute state in one of the toilets. And ‘legacy’ is completely appropriate when attempting to describe the participants in this Saturday’s Mitre 10 Cup, alias the NPC Rugby final. Canterbury versus Wellington, Auckland versus Waikato, Otago vs Southland, Taranaki vs Whanganui, and East Coast vs Poverty Bay are very traditional rivalries, but today’s one is possibly the daddy of them all. In the North Island corner, wearing the blue and white, it’s Auckland- winner of sixteen NPC titles since the competition’s inception in 1976. In the South Island corner, the famed red and black of Canterbury; possessor of fourteen titles. They combine for the round number of 30 titles out of 42 editions of the NPC. That’s one heck of a stat in a country with traditional strength in its rugby right across its top-tier unions. The next best is Wellington, with four. In the way of orange being the new black, or black being the new black within the latest ABs jersey at another interminable launch, red and black nowadays reads as the old blue and white. That being in relation to the hatred, envy or grudging admiration from all the other regions, because Canterbury of this generation are Auckland in drag from their golden era of the mid-80s to mid-90s. The period over which the Auks won 10 out of 12 NPC First Division titles. They as well made a scarcely believable sixty-one defences of that greatest of sporting trophies along with the FA Cup, the Ranfurly Shield, in that period (from Sept 1985- Sept ‘93). The next best is twenty-five, by Canterbury 1982-85 and the Auckland team of 1960-63. The famous Hawke’s Bay team of the 1920s sit just behind on twenty-four. Within this era, Canterbury have been almost as dominant. To illustrate that, at the conclusion to 1997 they had only been champs on three occasions. In fact, up to 2008 it was only five times overall. But since that point they have got about as annoying as that ‘trivago’ presenter from the TV, in notching up another nine. Taranaki interrupted a run of six in row in 2014. Otherwise it would have been ten straight. (If old sportsfreak himself thought they were already insufferable enough now, just imagine that eventuality). The 1985 ‘Match of the Century’ between the two was certainly incredible. But almost as good, and in some ways a little better quality-wise, was their 1986 return clash on Eden Park. We watched it from the eastern terraces (and weirdly, sitting directly behind was Ian Smith, the ex-international wicketkeeper and long-time Sky commentator. I recall he had come home early from the tour of England). Strangely, even my mother came along to join Dad, my younger brother and I- meaning it must have been a highly important match indeed. The atmosphere was like nothing I’ve ever experienced at the Park, before or since. The place was chock-full. It may as well have been Liverpool against Manchester United, the NZ rugby version. A raucous chant of “Auuuuckland” frequently went up from absolutely thousands, especially throughout the second half. The place is like a library now in comparison. Not that that’s any great surprise. 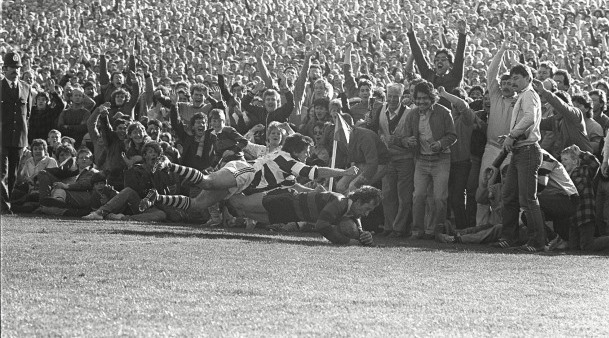 In the match itself, the Cantabs were ripped asunder by Steve McDowell and the Auckland front row in the scrums, but thanks to the almost indomitable will to win of players like Dale Atkins, Craig Green, Warwick Taylor, Bruce Deans and ‘Worzel Gummidge’ Earl, they actually looked the more likely team heading into the final quarter. But once fullback Greg Cooper had scored a superbly-worked blindside try, Auckland took control. And with Grant Fox playing conductor after that, they eventually got home by around ten points. What an unbelievable gesture by Auckland Rugby to allow free admission. Hopefully it all works out logistically and they’ve been liaising with Auckland Transport and all the other relevant entities to ensure the fans can get in on time for kick-off (not forgetting safety- oh so important). It should be a fantastic occasion. And with a potentially full ground and an afternoon start, a really welcome throwback.